Copyform Business Systems is a Leeds based company that was established in 1978. 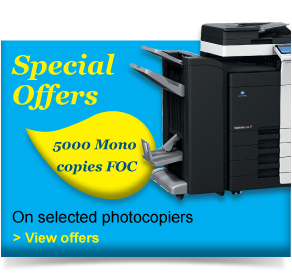 We are a multi branded company specialising in the sale and service of Konica Minolta and Ricoh multi functional printers. Our growing list of discerning customers includes local Government & Education Departments, Financial Institutions, SME’s and Large Corporates. As a independent supplier we are able to pick and choose the optimal solution for your print and document requirements. We offer a localised service to our clients in the north, however, we are also able to supply and service products on a national basis through our network of approved dealer partners. At Copyform we strive to build a lasting relationship and address both the short and long-term business needs of our clients. This complimented by our straight forward agreements, friendly professional staff and conscientious after sales care makes Copyform the right choice to support your company’s requirements whether large or small. We are experts in delivering a complete range of photocopier, printer, facsimile and internet solutions, Copyform has the capability to provide the equipment and services you require to achieve your business goals. To improve the efficiency of your document management and take advantage of today's office technology, simply contact us for a no obligation discussion.